The last album 'The Fall of an Empire' was a good album, but the band took the title too literally. Due to personal problems the whole band including singer Max Leclercq quit. So original member Philippe Giordana was the only one left. To fulfil the third and final part of the fantasy saga Osyrhia, he found 17 guest musicians to record 'Score to a New Beginning'. If you want to know all seventeen, I advice you to look on the internet, I just stick to the prominent ones. Lead vocals are done by none other than Marco Sandron (Pathosray). Add. vocals on tracks 2, 3, 5, 9,10 by Georg Neuhauser (Serenity), lead vocals on track 10 by Flora Spinelli (Kerion), Fabio D'amore (Pathosray) on bass, Chris Menta (Razordog) on guitars and Willdric Lievin (Hamka) on drums. Of course the music can't do without female vocals, they are filled in by Klaaire (Syrayde) and Geraldine Gadaut (Benighted Soul). The songs are first class symphonic metal - even more bombastic than on the last album. Marco is one of the worlds best vocalists and adds the cherry on the pie. 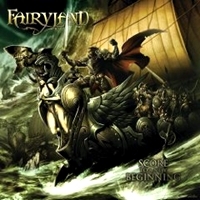 Similarities with Rhapsody of Fire are there, but the Fairyland songs are a bit slower in general. Some songs almost sound like a movie-soundracks and the choir-singing reminds me of Blind Guardian. Philippe is a very talented songwriter and with the epic majestic arrangements this record has to be one of the best in their genre this year. Not convinced yet? Just listen to the majestic symphonic middle part of the title track and you will be! Fans of Rhapsody on Fire, Symphony X, Kamelot, Blind Guardian and Avantasia can write down the release date to be one of the first to enjoy this album. Or better yet, order it up front!